SCP-1405 in its inactive "pose"
Special Containment Procedures: SCP-1405 is to be housed in a standard large-animal high-security enclosure at Bio-Research Site 13. Enclosure climate control should emulate the average conditions of spring or early summer in midwestern North America, as well as an appropriate day/night cycle. The enclosure is to be planted with vegetation consistent with a North American deciduous woodland, including several large trees to allow SCP-1405 to graze as it presumably would in the wild. Plant materials should be supplemented daily with 25 kg of fresh, high-quality hay and a source of clean water. Weekly treats consisting of 5 kg of plastic or silk imitation plant material may also be provided as rewards for good behavior. SCP-1405 is to be monitored at all times by a series of closed-circuit cameras. Personnel interactions are currently allowed only for feeding and cleaning duties to prevent causing distress to the subject. All other access must be approved by Dr. Haury, the onsite veterinarian. Update to Containment Procedures: While SCP-1405 itself is considered a low risk subject, following Incident 13-1405a (see Incident Report below) the subject is to be immediately relocated to a high security containment area to reduce the risk of a breach by external forces. Onsite security presence at Bio-Site 13 is to be increased immediately at both SCP-1405’s containment area and the site perimeter. Additional security cameras are to be installed on the exterior walls of the containment area, and the security feed is to be monitored at all times (see updates to protocols for Low-Security Containment Facilities.) Any change in SCP-1405’s behavior should be logged and immediately reported to Agent McComb or the security chief on duty. 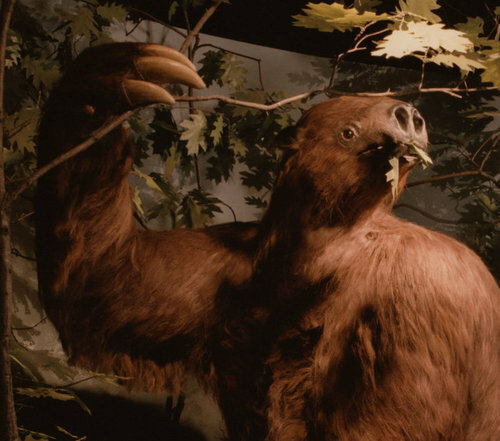 Description: SCP-1405 is a life-size, museum-quality model of an extinct giant ground sloth of the genus Megalonyx. The subject stands 2.9 m tall at the shoulder when resting on its hind legs, and weighs in excess of 350 kg. In its inactive (or camouflage) state, SCP-1405 appears to be a normal model: X-ray scans indicate it is composed primarily of plastic resin on an internal metal scaffolding. The subject’s anomalous properties become evident only when it is left undisturbed for a variable period of time (usually 6 to 8 hours, with a range of 45 minutes to 4 weeks). If undisturbed, SCP-1405 will enter its active state and begin moving around its enclosure, despite the fact that its body has no apparent musculature, internal organ structure, or even moveable joints. Hairs recovered from the enclosure during cleaning are primarily synthetic fiber, but a very small number (<1%) are mammalian hairs with mitochondrial DNA similar to that of extant sloth lineages. The subject’s active state behavior is comparable both to extant species of sloth and to other large herbivores. Most of its time is spent browsing on the vegetation in its enclosure, but it has also been observed sleeping in a ground nest constructed in a secluded area, scratching and rubbing on trees, and playing with various objects. Examination of high-definition video footage indicates muscles moving under a flexible hide and breathing movements in the chest, suggesting that the subject undergoes considerable morphological change between active and inactive states. SCP-1405 consumes plant material at a rate consistent with other mammalian herbivores of its size, but does not excrete. It greatly prefers an herbivorous diet, but will also consume meat, wood, plastics, plaster, and bite-sized pieces of metal. How it metabolizes food is unknown, and in its inactive state, it does not appear to need food, oxygen, or sleep. It has also exhibited a fondness for decorative imitation plant material, which appears to have been its primary diet before being placed in Foundation custody. If startled, SCP-1405 will instantly revert to its inactive state, “posing” by sitting on its hind legs with one forearm raised. It appears able to maintain this state indefinitely, and will not react to any stimuli, including physical trauma. SCP-1405 retains memories of events during its inactive state: after the removal of tissue samples and other traumatic tests, it remained inactive much longer and behaved in a nervous, agitated manner after returning to its active state. While agitated the subject may become destructive, and has caused significant damage to its enclosure attempting to breach containment. For this reason, unnecessary human exposure has been suspended. When allowed to remain active, damage caused in the inactive state will heal at approximately 3 times the normal rate. Recovery Log: SCP-1405 was discovered on display in a large diorama at the ████ ████ Museum of Natural History in 1992, in the pose it maintains while inactive. Museum inventory indicates that the original sculpture was created in 1978 by Alicia Mayberry, an artist routinely employed by the museum. None of the artist’s other works exhibit anomalous properties. SCP-1405 was displayed for twelve years, and exhibited no anomalous properties during this time. It came to the Foundation’s attention when Agent McComb, embedded in the ██████ Police Department, responded to reports of repeated vandalism at the ████ ████ Museum of Natural History. In May of 1992 the doors of the museum were found smashed open, as though impacted by a large object travelling at considerable speed. SCP-1405 itself also exhibited considerable damage, including a number of long, jagged cuts to its back and face, large bald patches, and several broken claws and teeth. It was repaired and returned to display. Dried patches of a clear, sticky liquid, reported by police as some type of glue, were found on the door, in the museum foyer and near the subject’s diorama. No testing on the liquid was conducted, but examination of crime scene photographs indicate that the spatter pattern is consistent with blood spatter from a large, wounded animal. Approximately once per three months thereafter, museum employees found all decorative vegetation in SCP-1405’s area stripped bare. SCP-1405 itself appeared to undergo rapid deterioration of claws and teeth, and would consistently lose large patches of hair despite repeated restorations. Agent McComb contacted the Foundation, and SCP-1405 was removed from display and placed in a standard containment facility at Site-19. Surveillance cameras first observed it entering its active state three weeks later, whereupon it was reclassified as a living organism and transported to Bio-Site 13. Addendum A: Dr. Haury has noted that the recurring damage to SCP-1405 while on display as a museum piece (hair loss, tooth and nail degradation, etc.) are consistent with symptoms of chronic malnutrition and insufficient living space in large mammals, and its active state behavior is often consistent with zoo and circus animals subjected to long-term abuse. These symptoms have not been observed since the current containment protocols were adopted. Addendum B: Plans to gradually acclimatize SCP-1405 to human interaction approved as of May 2011, when the subject was observed returning to its active state only ten minutes after cleaning personnel exited the enclosure. SCP-1405 has since returned to active state with a researcher present in the enclosure several times, provided the researcher remains still and silent, and recently remained active while cleaning personnel were present. It is hoped that acclimatizing SCP-1405 to human presence will allow further research into its active state functions, as well as a potential insight into the behavior of a prehistoric species. Incident 13-1405a Log: At 0125 hours on December 13, 2012, the north-facing exterior wall of SCP-1405’s containment chamber was impacted at considerable speed by an unobserved object. The object was of sufficient mass and travelling at speeds high enough to crush the exterior cinder block and distend the interior steel wall, although the containment cell was not breached. The external walls showed multiple deep scratch marks in a pattern comparable to a bear or other large predator’s claws. Perimeter security cameras did not record any object or person entering the facility compound. A vertical tear in the southwest section of perimeter fence was found following the incident: the fencing appears to have been cut with a knife or similar sharp object. An external camera near SCP-1405’s containment chamber recorded the impact and damage to the building, but the object causing the damage is not visible in the footage. This camera and the cameras in SCP-1405’s enclosure recorded scraping and clawing sounds which continued for four minutes following the impact. For approximately 24 hours prior to the incident, SCP-1405 exhibited signs of considerable distress, pacing constantly and refusing to eat or drink. It was observed staring intently at the north wall of its enclosure and emitting whining and growling vocalizations. 2 hours prior to the incident, the subject entered its inactive state without apparent provocation, situated with its back to the south wall and its paws raised to cover its face and head, in the only known deviation from its normal inactive pose. The subject remained inactive in this position for two weeks following the incident, and behaved in an agitated manner for several weeks after becoming active again.